Washington - Palestinian President Mahmoud Abbas told U.S. Jewish leaders on Wednesday that he would never deny Jews their right to the land of Israel, according to participants of the two-hour roundtable discussion. Some 30 Jewish leaders from organizations such as AIPAC, the Anti-Defamation League, and the Conference of Presidents of Major Jewish Organizations took part in the Washington meeting, which focused mainly on the indirect peace talks and violent incitements. “I am sure some people don’t agree with him but the fact that everybody showed up was pretty encouraging,” one of the participants told Haaretz.. The Palestinian president said during the discussion that he had in the past proposed creating a trilateral commission to monitor and punish incitement, but that Israel did not agree to it. When asked what he could offer Israelis to show that he was serious about peace initiatives, Abbas reminded the participants that he had addressed the Israeli public in an interview on Channel 10. “Why wouldn’t Bibi go to Palestinian TV and do the same?” said the Palestinian president. “I would never deny [the] Jewish right to the land of Israel,” Abbas then declared. Later on Wednesday, Abbas told Charlie Rose in an interview on PBS that Israel must agree to ceding East Jerusalem as the Palestinian capital as a necessary precondition for any peace settlement. 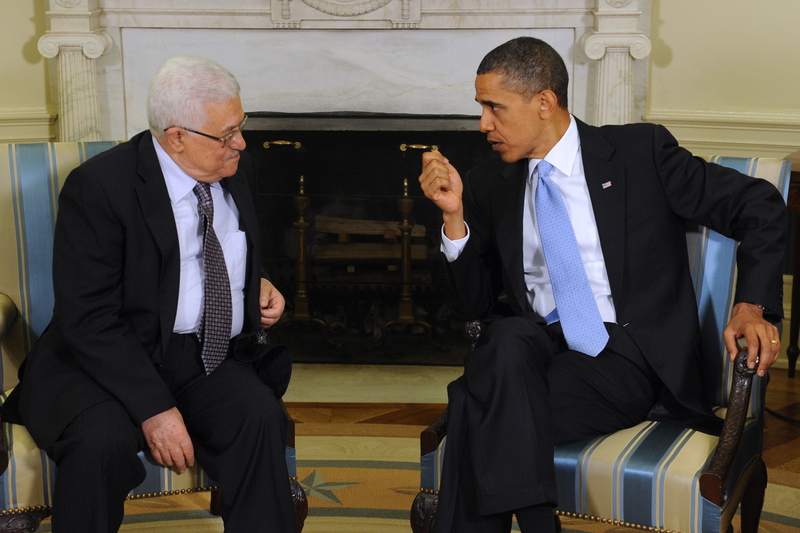 During that interview, Abbas also lauded Barack Obama’s administration and its efforts to bring forth a two-state solution. “This is the first time we hear from a U.S. administration talking about that the solution of a two-state solution is in the vital interest of the United States,” said Abbas. This child of a dog said: "... “I would never deny [the] Jewish right to the land of Israel,” Abbas then declared. ..."
Then he says: ".... “East Jerusalem is occupied territory. The entire world recognizes that including the United States of America,” Abbas told Rose. “We cannot accept any solution that excludes East Jerusalem.” ..."
This means (,if you believe this lying Mamzeir,) that he will agree to the Jewish right to Israel, provided that the PA gets Mokoim Hamikdosh and surrounding territory. That's like a person agreeing to having his heart removed and having expectations to live. How can any Jew agree to this? Same old bs routine: one speech in English, and the exact opposite in Arabic. Was his denial of the holocaust brought up at this meeting? How about his being responsible for dead Israelis years ago? How about his naming streets for known terrorists? Wow. I didn't know that there really was a palestenian state. Oh. and thank you for recognizing the state. You are gushing with gutzkeit. And we fools should believe you? What do you tell your buddies in Arabic? I have come to the conclusion that we are a stupid people. If Hitler YM"S would stand up in 1943 and say a similar statement we would kiss him and make goody goody. More appeasement for the messiah. These people have sworn to drive us into the sea. You don't change the heart of these people. Remember PM Meir, when asked when will there be peace in Is.? She said when the Arabs learn to love their children more than they love dying? I rest my case! this makes no sense when he both denies the holocaust AND THE BEIS HAMIKDASH! When asked what he could offer Israelis to show that he was serious ... Abbas (YS"V) reminded the participants that he addressed the Israeli public. Abbas was just given 400 BILLION dollars. I never heard anyone representing the United States say anything about Jerusalem being divided ever! That was never part of the solution!!!!! Those 30 or so leaders that showed up for this meeting must have a lot of time on their hands. I mean to want to sit down with a lying mamzer you got to really be bored, what can I say. When he is referring to not denying jewish rights to Israel, he is referring to Har Hazaysim and Har Hamenuchos and so long as we are underground. “I would never deny [the] Jewish right to the land of Israel,” Abbas then declared. ..."
Then why do you demand that no Jews live in PA controlled areas? Actually, it was "only" 400 million dollars. “ And we fools should believe you? What do you tell your buddies in Arabic? maybe if we would kiss hitler ym"sh instead of boycutting him & germany he woudnt kill so many jews even with his sinas yisroel (as said rabbi weissmandel z"l who was an expert in politics) why would we make the same mistake again hashem yerachem. Yea, let him say it on PALESTINIAN TV! ....first take East Jerusalem....!, There will never ever ever be a palestinian state, there has not been such a state in the past, now, or in the future. Any effort or money poured into such an initiative will sink into a deep evil void. The goiym are forgetting to include someone in this decision making process, As they always have. This Abbas is far more dangerous then Hamas: this is because while both the PA and Hamas have the identical goals, Hamas is honest and states their policy openly, while the empty suit Abbas lies, and pretends to be reasonable-What a farce! Some of you seem to be criticizing the Jewish organizations for even meeting with Abbas. As Shimon Peres once said "You make peace with your enemies, not with your friends". Abbas is all that we have right now, to negotiate with. In fact, the Israelis are in the process of training Abbas' security force on the West Bank, and have issued them weapons, other than sidearms. We cannot continue to occupy or adminster the entire West Bank forever. For example, after 27 years of occupation, the USA returned Okinawa to the Japanese people. It also returned Iwo Jima to Japan, after 23 years of occupation. The USA lost over 30,000 troops in taking those two islands. My point is that at some point occupations have to end, and there has to be some finality. Why not divide any other coutry,how can we divide G-D's gift? it is "NOT" an option. NOT Yesterday NOT Today and NOT Tomorrow. This is, was and always will be our land. Just look how much land the Arabs have, let them share with their so called Lovely Brothers. They all lack real education, they chose their own reality, all lies. You have swallowed the coolaid you were given. Hitler ym"s wrote a book called "Mein Kampf" and there he writes about the idea of annihilating the Jewish nation. So are you going to tell us that if a group of Jews hadn't announced a boycott of Germany that he wouldn’t have killed 6 million of us? As to Rabbi Weissmandel zt"l he wrote a sefer "Min Hameitzar" and there he doesn't talk about that boycott at all. To say that Rabbi Weissmandel talked about appeasing the Nazis is absurd. Worse then that, #20 believes him! Very naïve. The United States made peace with Japan which was a case of making peace with an enemy. The United States also made peace with England which was making peace with an enemy. But to compare this to making peace between Arabs and Jews in Israel is ludicrous. The United States recognized the Japanese nation and their right to their homeland Japan. OTOH, the Arabs to not recognize Israel’s right to any land. Even if you made a fictitious peace with one group still the rest of the group plus all the Arabs on earth will still want Israel wiped off the earth. Yes you make peace with enemies but you cannot make peace with someone who wants your total destruction. As to training Abbass’s “security” force, Israel has already made that mistake. This so called security force turned its guns to shoot at Israel. Fool me once…fool me twice… Any Arab security force in Israel are at best potential trained terrorists. How stupid can a people become? I would say, we’ll wait until you Arabs show that you are really interested in peace and until then we’ll keep building and building. Shut up Abbas you lieing dog. This dog has given MANY speeches at his terrorist PLO Meetings stating that Jews NEVER even LIVED in Eretz Yisrael. He is a disgusting liar and I am sick of his sickening lies. Enough already. Let him drink from the DEAD SEA and choke. in march 1944 adolph eichman met with the leaders of hungarian jews in budapest ie stern roth etc and said "i want to play fair with the jews"
Bad example. You don't make peace with your enemies. You make peace with your beaten enemies. The U.S. only made peace with Japan after they were vanquished and unconditionally surrendered. The 'occupation' will only end in the eyes of Abbas and Co. when all the Jews are dead and cleared out of Israel in its entirety. Someone has to win this battle and I'd rather it be us. Abbas gets up in a private meeting in front of a bunch of American Jews and says in English that he likes Jews. How brave. Let him go back to Ramallah and say it in Arabic. I refuse to believe that any rav would say something so stupid and wrong. There is no difference between that idiocy and the idea that converting to Christianity would save Jews in Germany. let him first stop denying the Holacaust and then he can talk to the so called jewish leaders as they call themselves. LIER! i hope no one on there right mind will fall for such false lies!